Drivers in the Carrollton area shopping for a used vehicle are sure to find what they’re looking for here at Certified Autoplex. Although we feature a lot of used luxury vehicles on our lot, we also have a wide selection of the more mainstream brands as well. Our team is working to put together research pages for drivers to use to assist them during their car buying experience. We’re working on not only highlighting specific brands but also specific models as well. This time we’re going to shine a light on GMC and focus in on the Acadia in particular. This midsize SUV is slightly larger than the GMC Terrain, which we’ve also covered in our research. 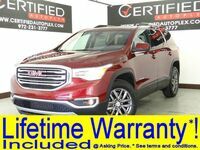 Right now on our lot we have three 2013 GMC Acadia models available to choose from. However, it’s important to note our inventory is constantly changing so it’s best to stay up-to-date with our inventory on the website. Drivers looking for extra seating may opt for the GMC Acadia versus the GMC Terrain. The Acadia offers seating for up to seven, whereas the Terrain has seating for five. 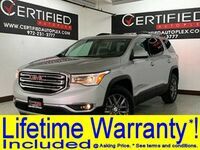 As mentioned above, there are 2013 GMC Acadia models available here at Certified Autoplex. All three are set with a lifetime warranty for an added peace-of-mind. Our team wants drivers to be completely satisfied with their purchase the moment they leave and years down the road. There are a few different trims to choose from for the GMC Acadia, but all three are equipped with the same 3.6-liter V-6 engine. It pumps out 288 horsepower and gets 270 lb.-ft. of torque. One of the most exciting features for this midsize SUV is the audio system, which features a Bose premium 10-speaker system with a subwoofer. There is also a USB port and headphone jacks for a friendly user experience. Additional convenience features include heated exterior mirrors, rearview camera and remote vehicle start. 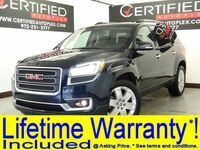 Those interested in learning more about the GMC Acadia are encouraged to contact our team here at Certified Autoplex for more information. 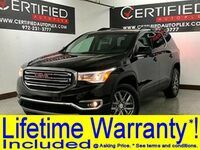 Drivers are welcome to schedule a test drive online or visit us today to get behind the wheel of this midsize SUV. Interested in a Used GMC Acadia?